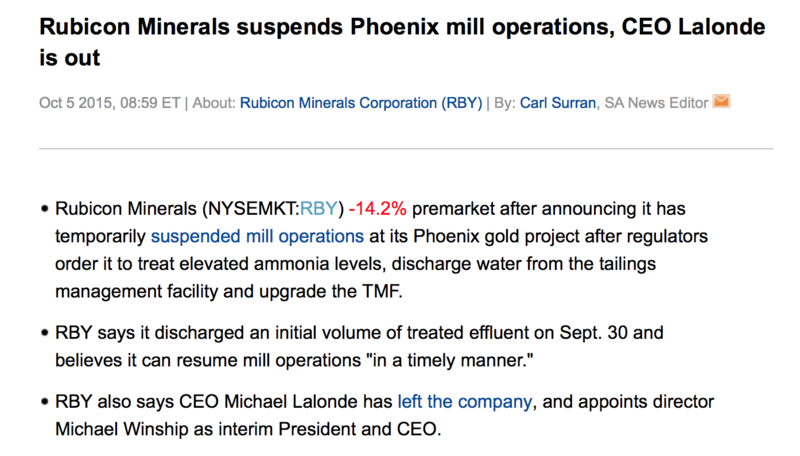 Rubicon Minerals Corporation (TSX:RMX)(NYSE MKT:RBY) (“Rubicon” or the “Company“) has been ordered by the Ministry of Environment and Climate Change (“MOECC“) on September 30, 2015 to temporarily suspend mill operations at the Phoenix Gold Project (the “Project“) to treat elevated ammonia levels, discharge sufficient water from the tailings management facility (“TMF“), and to upgrade the TMF, under specific timelines. The initial order received on September 8, 2015 ordered Rubicon to commission new interim and permanent ammonia treatment systems for the effluent held in its TMF and discharge a portion of treated effluent. It also ordered Rubicon to undertake other operational and reporting obligations, including construction upgrades to the TMF. The initial order was amended by the MOECC on September 14, September 18, and September 30, 2015 to allow the Company time to upgrade its facilities in order to discharge treated effluent. The Company has been utilizing alternative technologies to address the ammonia levels in the TMF. Rubicon has made progress with respect to treating the effluent and believes it can resume mill operations in a timely manner. Rubicon discharged an initial volume of treated effluent on September 30, 2015. At the current time, underground development, construction and trial stoping continue uninterrupted. As it grows from junior explorer to junior gold miner Rubicon Minerals (TSX: RBY) pulled a deeply experienced mine operator away from Goldcorp’s upper echelons to take its top position. Rubicon said Monday that Goldcorp’s director of underground mining, Michael Lalonde, was coming on board to take over as president and CEO. He replaces David Adamson who has moved Rubicon from discovery through development, most recently raising some C$200 million to build Rubicon’s flagship Phoenix gold project in Ontario’s Red Lake gold district. It is a transition that can be awkward for a junior-miner-to-be, sometimes for lack of experienced managers on the market or alternatively for recalcitrant incumbents loathe to let upper positions go. Not so for Rubicon. In Lalonde Rubicon gets an old hand at running underground mines such that Phoenix will be and one of the top managers operating in the Red Lake district. Among Lalonde’s credits are running Goldcorp’s Red Lake mine, known for its stellar grades over 20 g/t gold, and overseeing development of its Cochenor gold project, also in the Red Lake district. Outgoing President and CEO David Adamson will hold onto the CEO title for six months while Lalonde learns the ropes at Rubicon and will then take over the chairman position on Rubicon’s board. In an exit interview Adamson told Mineweb that leading Rubicon has been a matter knowing your strengths and surrounding yourself with people that complimented your weaknesses. Lalonde has “all the pedigree that is necessary to lead the company,” Adamson said. Lalonde, he said, knows the Red Lake district backwards and that it was time for an “operative man” to take command. TD Securities analyst Daniel Earle commended Adamson for making the move. For Lalonde, coming with his Red Lake background, the Phoenix gold project will be familiar territory. It is planned as a high-grade, 1,250-tonne-per-day underground mine with life of mine production to be around two million ounces over a dozen years. Turns out, that was a mistake. At this time, Mr. Lalonde has been replaced as CEO and Michael Winship has been installed as interim President and CEO. The net effect of the orders is to temporarily suspend mill operations and the discharge of mill process wastewater to the TMF until the interim ammonia treatment system can be commissioned and proven effective to the MOECC’s satisfaction. Based upon the current advice of our engineering consultants, this process is expected to take two-to-four weeks. The Company’s engineering consultants are also reviewing the water balance of the TMF and there is the potential that the required discharge of treated effluent could be significantly lower than 140,000 m3, due to low precipitation during the recent months and other factors. The Company is required to meet its discharge obligations no later than November 30, 2015. Rubicon will provide additional updates with respect to the progress of its activities. All underground development, construction, and trial stoping activities are continuing during the suspension of mill operations. Mineralized material from trial stoping will be stockpiled on surface in anticipation of the resumption of mill activities. Underground development and construction activities continue and the Company will provide a Project update, including the results of the trial stoping, within the coming weeks. Full Disclosure: I am long RBY. I am HOLDING shares for now.